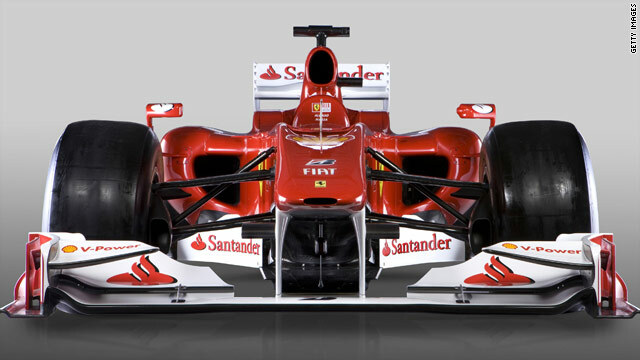 Ferrari are hoping the new F10 car will see them return to the front of the Formula One grid. (CNN) -- Ferrari have unveiled their new car, the F10, which the Italian manufacturer hopes will see them return to the front of the Formula One grid. Last season saw Ferrari struggle to keep up with Brawn GP, McLaren and Red Bull and team boss Stefano Domenicali told the BBC that he believes the new car will be far more competitive than the 2009 version. "We are coming off a season that was not competitive and this should mark a turning point. We want to win the world title once again," said Domeniciali. Two-time world champion Fernando Alonso's move to Ferrari was one of Formula One's worse-kept secrets but, now his move has been confirmed, the Spaniard admits he cannot wait to get started. "This is my first presentation with a Ferrari and it's very exciting," he told the official Ferrari Web site. "I want to thank the team for their great work, but also the sponsors and everybody else." This is my first presentation with a Ferrari and it's very exciting. I want to thank the team for their great work, but also the sponsors and everybody else. Alonso will partner Brazilian Felipe Massa, who has now fully recovered from his life-threatening crash in Hungary last July, and chairman Luca Cordero di Montezemolo believes both drivers will compliment each other superbly. "They know how to race for a team and not for themselves. I'm expecting a lot from them. Felipe is strong, stronger than he has ever been. In Budapest I told him: 'you'll be back even stronger'' and he has." Formula One rules changes have been taken into account when constructing the new F10 and Luca Marmorini, head of engine and electronics, commented: "From a technical point of view reducing the consumption was one of the most interesting things this year. Consumption means performance. "There won't be any refuelling anymore so consuming less means less petrol on board and therefore better lap times. Whoever consumes less will be faster on the track."